Unlike standard "mogul" based bulbs, Double-Ended bulbs do not simply screw into a socket. 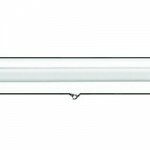 Instead they, are installed into brackets that must be fully closed after inserting the bulb. It's VERY IMPORTANT to do this process correctly or a dangerous fire hazard could result. 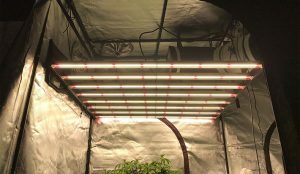 Unlike standard "mogul" based bulbs, Double-Ended grow light bulbs do not simply screw into a socket. Instead, they are installed into brackets that must be fully closed after inserting the bulb. It's VERY IMPORTANT to do this process correctly, or a dangerous fire hazard could result. Whenever working with HID bulbs, be sure to wear gloves to avoid oils from your hands contaminating the quartz glass of the bulb surface. These oils can cause damage to the bulb. If you do handle the bulb without gloves, you must clean the surface of the glass before turning the light on! Inspect the wire ends of the bulb to ensure they are straight and not frayed. If needed, straighten them and twist to correct any fraying. Open both of the brackets on the light fixture to their fully open position. Insert the bulb with the flat side of the bulb end seats into the bracket correctly as shown below. Look into the bracket to ensure the wire end will be fully seated in the metal sides of the bracket when it is closed. If the wire was bent when installing the bulb, remove it and straighten before installing again. The brackets will now slide toward the bulb. There should be a "click" when they are fully seated. Be absolutely sure the bracket is fully closed and that the wire end is clamped properly in the metal part of the bracket. Your bulb is now installed properly. When turning any HID bulb on for the first time, be sure to let it remain on for at least 30 minutes to allow the salts in the bulb to "burn in" properly. Failure to do so could damage the bulb and reduce it's performance and lifespan.